Come join us. 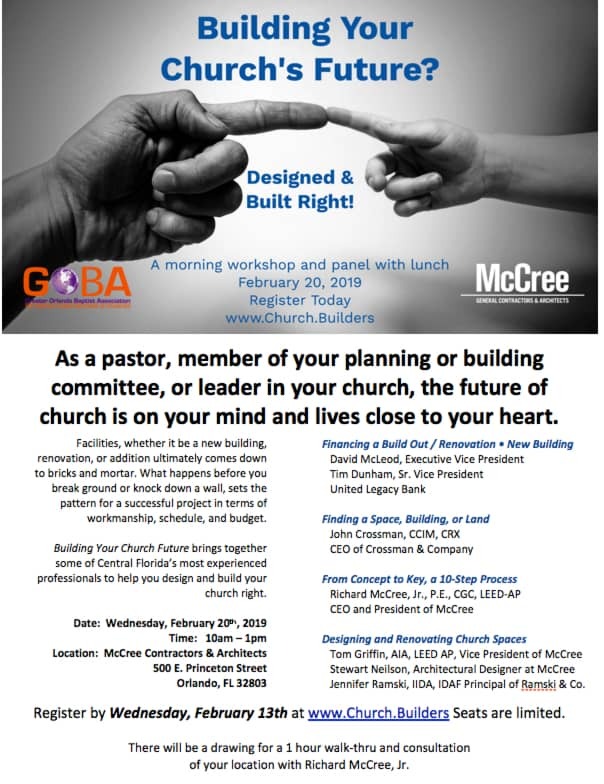 The Building Your Church’s Future event is open to all who are building or planning to build a church, church school, campus expansion, or sports/recreation/worship center. New church construction is a big investment for any congregation. It is also a monumental task too often ripe with competing interests and doubters mixed in among the donors and encouragers. Growth does that! It’s painful to see non-design and construction-related factors nicely align and move forward only to see the actual project itself fall prey to construction-related risks, price overruns, and other problems. It is especially taxing on the already overscheduled pastors and the volunteer building committee members and church leaders. Building Your Church’s Future is designed to help church planters and builders glean a solid understanding of what’s involved in the church financing, site selection, design, and construction processes. May we help you avoid the really big rookie mistakes made by so many church building committees? We’ve been building churches in the Orlando area since 1926, so we know a thing or two plus we gathered some truly talented professionals with insights and wisdom in their related fields. Special thanks to Mark Weible of the Greater Orlando Baptist Association. He has been a generous co-sponsor of the event, opening it up to all denominations and community churches. For the McCree team and family, it is a blessing when we’re able to give back from our direct expertise.